We know that the idea of using a permanent haircolor can be intimidating. But under the care of a salon professional, it doesn't have to be! Let's face your permanent haircolor fears together, by setting the record straight on 4 of the most popular myths associated with long-lasting color. Permanent haircolor works by interacting with the natural pigment of your hair and changing your hair’s structure. The dyes in permanent haircolor are actually tiny colorless molecules. With the help of ammonia, they penetrate the hair cuticle, but it’s not until they’ve combined with hydrogen peroxide and create a chemical reaction known as oxidation that the magic happens. Through oxidation, the permanent haircolor molecules turn complex and can embed themselves in the structure of the hair fiber. The result is what we know to be permanent haircolor, or at the very least, haircolor that can definitely withstand multiple washes. One of the biggest reasons permanent haircolor gets a bad rap is because it consists of more potent chemicals than demi-permanent haircolor, which instead coats the hair, but doesn’t alter the structure of it. Permanent haircolor also opens up the cuticle and needs to sit on the hair longer, so hair texture might change slightly. Permanent haircolor contain chemicals that remove color from your strands as well as pigments that change your hair’s current color. And as mentioned before, since permanent haircolor is meant to withstand many washes, the chemicals have to be stronger, and they’re left on hair longer. Exactly how long does permanent haircolor last? That depends on your hair growth rate, but you typically won’t have to retouch your roots for 4 to 6 weeks. While it’s an understandable concern that permanent hair dyes can wreak havoc on hair strength and elasticity, permanent haircolor and extreme damage don't go hand-in-hand when left up to a professional. After a professional permanent haircolor service, your hair will still look and feel amazing, even while sporting a new shade. Since no one wants to leave the salon with straw-like, dry, brittle hair, make sure to opt for a salon service to protect your hair when it gets colored. 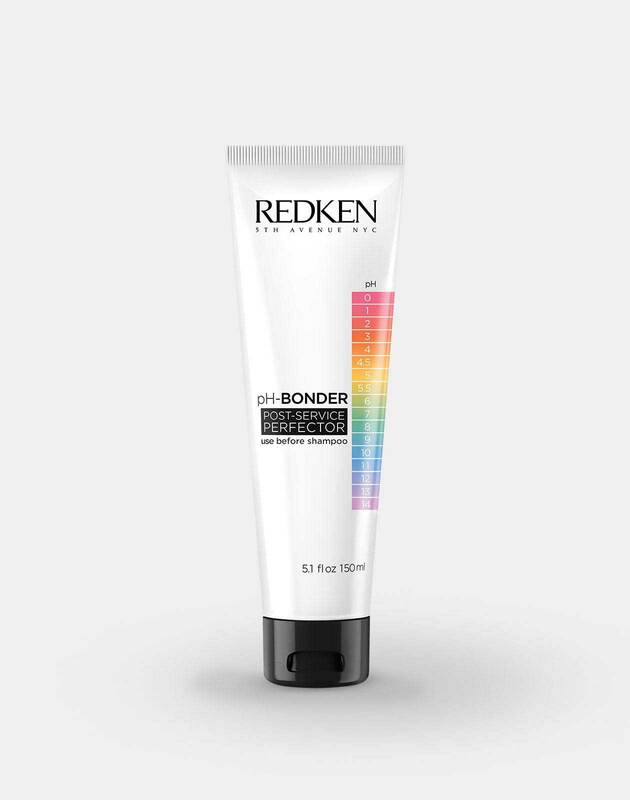 Redken’s pH-Bonder protects bonds, helps restore the hair fiber and smooths the hair cuticle, so strands are stronger, shinier and softer. There are also several things you can do at home keep your newly-colored hair in great shape, such as using a deep-conditioning hair mask, like Redken’s Color Extend Magnetics Mega Mask, on a weekly basis or using a shampoo for colored hair, also from Color Extend Magnetics, to gently cleanse and prevent fading. MYTH 2: YOU'LL GET MONOCHROMATIC, DULL, FLAT COVERAGE THAT SCREAMS "FAKE!" Opting for permanent haircolor doesn’t have to mean coloring your hair just one shade. Dimensional color is a gorgeous possibility. Since most people have natural highlights in their hair from the sun, opting for permanent dimensional haircolor will add depth and promise more natural-looking results. Redken’s original Chromatics, Color Fusion Advanced Performance Color Cream and new Cool Fashion Color Cream are all permanent haircolor lines that provide a multidimensional, natural-looking finish. Chromatics is ammonia-free and leaves hair 2x stronger than before it was colored, while Color Fusion Advanced Performance Color Cream leaves hair shiny. Permanent haircolor is a wonderful option for concealing gray hair since it’s typically available in a larger variety of shades and will provide longer-lasting results than a demi-permanent haircolor. But covering grays isn't be the only reason to opt for permanent haircolor. Trendy haircolor looks like ombre and balayage often incorporate permanent haircolor at the root in addition to lightener for the ends. In order to create a natural-looking gradient. However, if you are looking to fully cover gray hair, Redken's Cover Fusion line of permanent haircolor, a low-ammonia color cream with conditioning agents make gray strands stronger and more manageable post-service. Brassiness can happen whenever your new haircolor starts to fade away and the natural pigments of your hair that weren’t lightened away with bleach or haircolor start to surface. While brassy hair is certainly annoying, you can postpone or make brassiness less likely to occur in the first place by taking the necessary lightening measures. Carefully choosing the right shade off the bat—one that has a good amount of cool tones—can help you avoid that dreaded orange tinge from later revealing itself later. Redken’s new Cool Fashion collection by Color Fusion, which features 14 new cool shades, aims to combat brassiness by starting off and staying cool for up to 8 weeks. The best way to choose a permanent haircolor that will compliment your undertones is to consult with a professional colorist. Find a Redken salon near you for the ultimate haircolor experience.